The papers for the February 11, 2011 Crop and Scrap Kit will be one each from the Presto Patterns, First Edition, and Springtime Vintage Designers Series Papers. 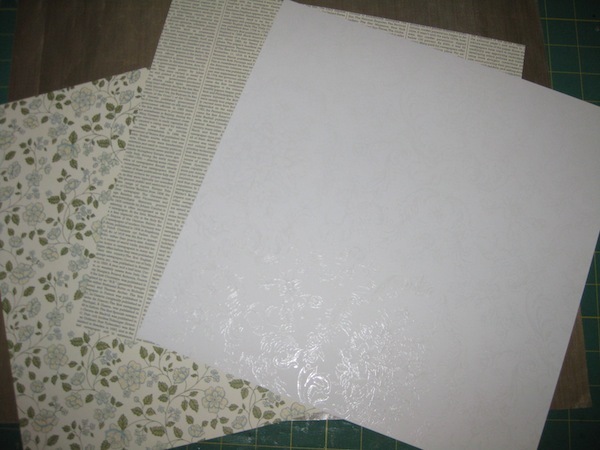 The papers will be cut in 4″ widths. For the back of the pocket area the lengths will be 6″. The pocket fronts are 4″ x 4-1/2″. Each of the papers in the kit will be different from the next kit because there are only two of each sheet of paper, except for the First Edition papers which has four of each print. 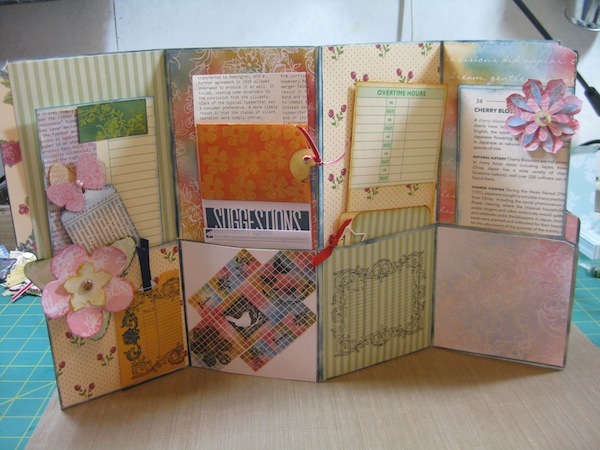 These three sheets of paper are more than enough to create this one mini album. Even if you want to cover the front and back of the time cards which are 3-1/2 x 8-3/4″. Add your own papers into the mix if you choose to. If you choose to leave the Time Cards bare there will be a lot of paper left over and you might think about adding a strip or two to hide the total look of the Time Card. The coin envelopes will also cover quite a bit of the Time Cards too, saving paper to use on the tags. Since I don’t have a clue what type of pictures you wish to put in the mini I am leaving the embellishing up to you. If you are looking for a project to do for your newborn baby or grand baby then the pieces I’ve used won’t work for that. 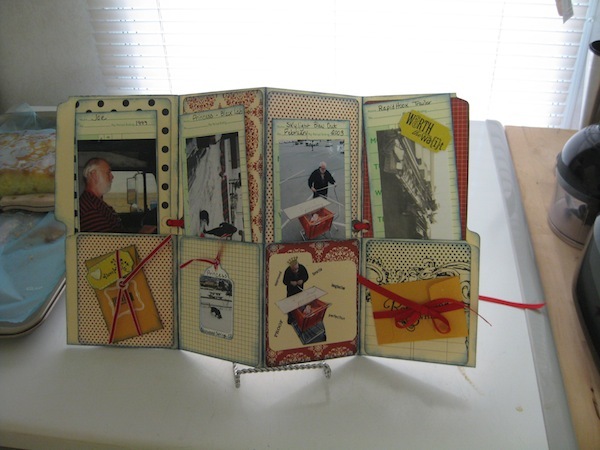 If you choose to cover the Time Card with paper you can work around the photos you wish to use from the scraps left over in covering the pocket areas. Once you have the directions for folding the legal sized file folders into the shape necessary for this mini you can think about using the papers and things you already have on hand. With Sale-A-Bration going on now and through March 31, 2011 you can take advantage of the FREE stuff when you order the Butterfly Prints, Notably Ornate, or Vintage Vogue stamp sets along with any other items you wish to get in your $50 order. You can even purchase your very own pack of Presto Patterns Paper and experiment with it. Watch this video to see what each type of mini album looks like, either fairly plain or totally embellished. It started with using Presto Patterns Paper, the Island Floral die, and Stampin’ Pastels chalks. I thought the edges needed a bit more oompha. I was using the Craft Mat Maureen had given to me already. With the Pretty In Pink Stampin’ Spot I smooshed a patch on the craft mat and squeezed a dab of Glossy Accents in the ink then smeared it around with a toothpick. That resulted in a pink mixture that applied well to the edges of the die cut pieces of the flower. I then went on to using the Garden Green and Summer Sun ink spots to work on the other pieces. I cleaned up after each application and it all came right off the craft mat with no problems. That got me to thinking about adding glitter in the mix. Knowing that Glossy Accents will dry out and become really hard in time I chose to leave the glitter out of the mix and only add it as I needed to apply it. I had stamped the Notably Ornate image on a coin envelope and it looked like it needed to be gussied up a bit so why not try it on that? If it failed then I had not lost much and had learned something in the process. You can watch the video below to see how this experiment progressed. Personally, I would not advise mixing up a batch with the Glossy Accents or Crystal Effects and trying to store them. The glue dries after a while and becomes totally hard. While it stays liquid in the original container I have no idea what would happen if you mixed in drops of ink for color and added the glitter. It might separate and the results would be a solid mass in a bottle. As to the question of using Craft Inks in this type of application I would think they would work better than the Classic Inks since the Craft Ink has a longer “wet” time. This “scientist” did not do her own “diligent trials” in this experiment and pretty much did things as usual – by the seat of her pants. As to the question of how much ink to use on the craft mat? I smooshed out enough that I could see it on the mat and have no idea how much I used. The next question would be using drops of ink with the glue and I don’t have an answer for that one either. All I can affirm is what I have done and had success with. The rest will have to wait until later OR until I hear from you other “Scientists” what your results had been.